When you play blackjack, you want to have higher hand compared to the dealer's hand. You need to do that without exceeding 21. If you do that, you will bust and lose the game. Also, the main opponent at the table is the person who distributes the cards, known as the dealer. There are many different types and subtypes of this game but the basic rules do not change. Bets - each player is obliged to set his bet for the next round. The dealer distributes the cards till all players have two cards. In most cases, the cards, which you will get, are face up, meaning that every person on the table will know exactly what your cards are. The dealer's two cards are one face up and one face down. When you play in a land based casino, you must not touch the cards, if both of them are in a face up position. After the distribution of cards is done, the players have to decide whether to ask for more cards, it is called "hit" or refuse to accept any more cards, called "stand". When all players made up their minds, the dealer decides the same thing for him. You will be surprised to know that dealers play by different rules, compared to those who apply for the players. 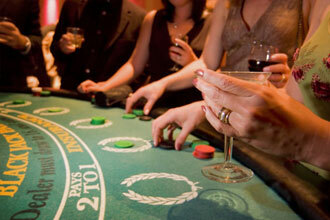 In most cases, if the hand of the dealer is 17 or more, he/she is obliged to call "stand". In special circumstances, you could ask for another card, if he has the so called "soft 17". If the hand of the dealer is below 16, he must take another card. This is another obligation, which you could as your advantage. You have the highest hand closest to 21, without going over it. The dealer exceeds 21, and then you automatically win.